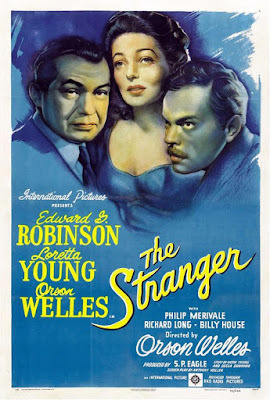 The Stranger (1946) Director Orson Welles’ tense examination of the evil that lies under our noses resonates long after the final scene. Welles stars as Charles Rankin, aka: Franz Kindler, escaped Nazi war criminal and one of the masterminds behind the concentration camps. He’s settled away from prying eyes in the small Connecticut town of Harper as a college history professor, and is poised to wed his naïve new bride, Mary (Loretta Young). 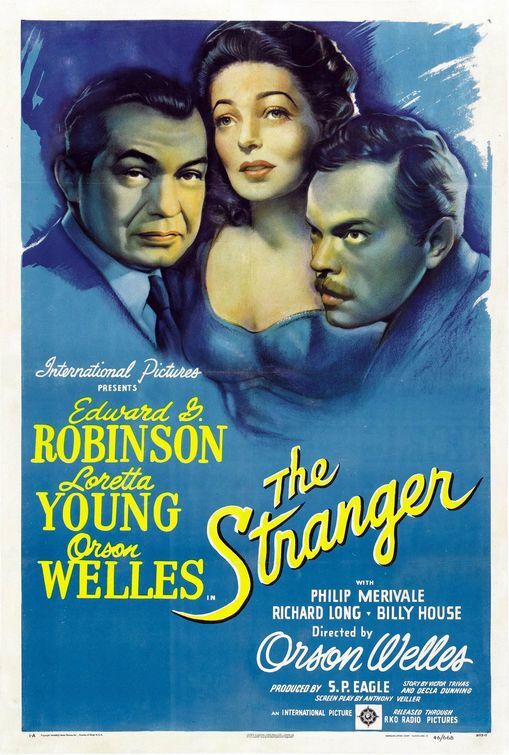 Edward G. Robinson (in a nice turn in a protagonist role) co-stars as government-appointed Nazi hunter Mr. Wilson, who is determined to bring Kindler to justice. In one disturbing scene, he attempts to convince Mary that her new husband isn’t the man he claims to be with a montage of clips depicting the atrocities in the Nazi concentration camps (Welles included actual concentration camp footage, adding a painful level of verisimilitude to the film). Welles masterfully depicts the behavior of a sociopath as his veneer of respectability is stripped away, and reduced to a cornered animal, thinking of nothing but self-preservation. The story comes to a memorable conclusion in a clock tower. Note: A huge thanks to Olive Films for providing a Blu-ray screener for this review. You can find it here. The Dark Corner (1946) Someone has it in for private detective Bradford Galt (Mark Stevens), and Galt’s former partner and con-man Tony Jardine (Kurt Kreuger) is the prime suspect. 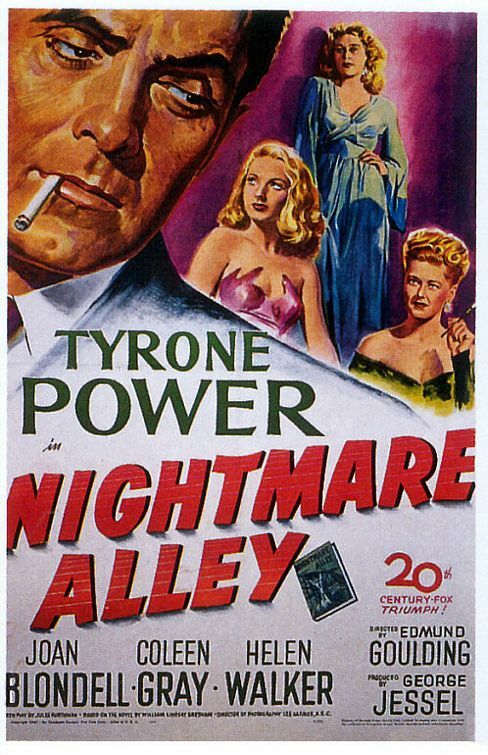 Jardine’s latest target is a wealthy art dealer and his trophy wife (Clifton Webb and Cathy Downs). 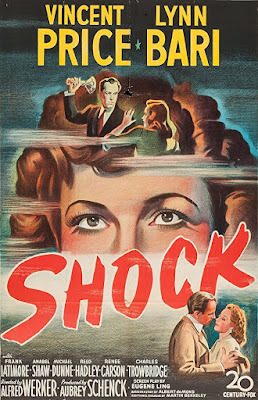 The real surprise in this fast-paced potboiler is Lucille Ball, in a dramatic role as Galt’s plucky assistant Kathleen. She’s loyal to a fault, resourceful, and knows how to think on her feet. Ball and Stevens share some good chemistry as their characters’ relationship becomes something more than professional. Also watch for a great supporting performance by William Bendix as Stauffer, a sleazy thug for hire. I Wake Up Screaming (1941) Victor Mature plays talent scout Frankie Christopher, who’s in over his head when his latest discovery, Vicky (Carole Landis) ends up murdered. 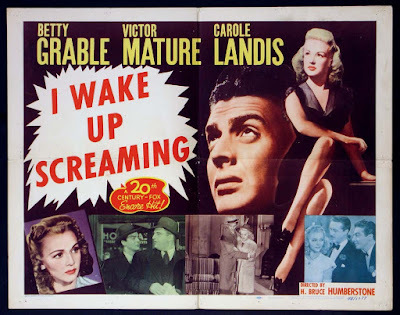 To complicate matters, he’s become involved with Vicky’s cynical sister Jill (Betty Grable). He’s dogged by Ed Cornell (Laird Cregar, in a deliciously enigmatic role), a tenacious police detective who’s convinced about Frankie’s guilt. It’s a race against time as he attempts to prove his innocence before Cornell can snare him in a trap. The film also features Elijah Cook, Jr., terrific, as always, as a shifty desk clerk at an apartment building. It’s certainly lighter in tone than the provocative title would suggest, but riveting nonetheless. Shock (1946) Janet Stewart (Anabel Shaw) witnesses a man murdering his wife, which sends her into a catatonic state. Unfortunately for Janet, her psychiatrist, Dr. Richard Cross (Vincent Price) is also the assailant. Price captivates as the conflicted Dr. Cross, who wrestles with his conscience about killing his wife, and torn between a doctor’s oath to heal and his desire to avoid getting caught. Lynn Bari plays his remorseless lover, Nurse Elaine Jordan, who keeps him wrapped around her finger. The two conspire to keep Janet sedated and out of the picture. 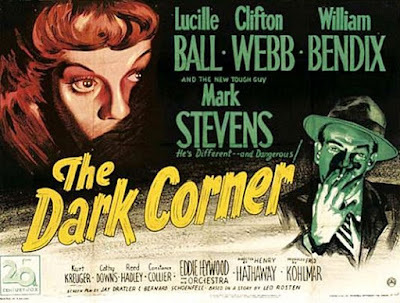 The plot may have more holes than a wheel of Swiss cheese, but it scarcely matters, watching the interplay between Price and Bari in this underrated noir thriller. 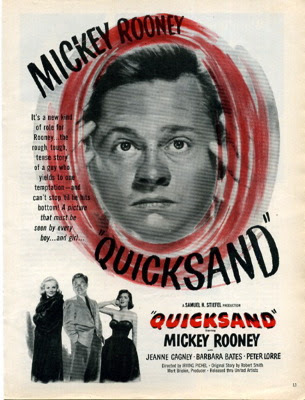 Quicksand (1950) Mickey Rooney stars as Dan, a ne’er-do-well auto mechanic up to his neck in problems. Dan arranges a date with Vera (Jeanne Cagney), a waitress at a diner with an eye for expensive things, but looks before he leaps (a recurring theme). Without a cent to his name, and unable to borrow funds, he takes matters into his own hands, pilfering a $20 bill from the repair shop cash register. The petty theft is only the start of his troubles, which continue to cascade, as he tries to replace the money, and only gets deeper in debt. Quicksand features a nice supporting performance by Peter Lorre as Nick, a seedy penny arcade owner. Unfortunately, Rooney just isn’t charismatic enough to carry the movie, and Dan, as written, is too self-centered and obtuse for his own good. By the time we’ve reached the film’s climax, our sympathy for his predicament has worn thin. It’s well worth a look for the atmosphere though, and Lorre is fine as always. A super-big thanks to Gill from ReelWeegieMidget Reviews and Cat from Thoughts All Sorts for hosting the Then and Now Blogathon, featuring a look at the work of our favorite classic actors in the past and present. My guest of honor is the late great Christopher Lee. You can read my recycled review of his “then” feature, Rasputin: The Mad Monk (1966) here. But what about “now” (or in this case, recent)? 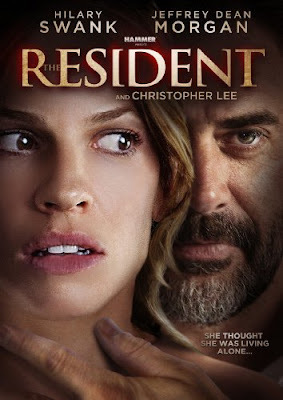 Why, I’m glad you asked, because my film du jour is The Resident (2011). Reviewing this film affords me the unique opportunity to examine a modern role from this amazing thespian, as well as look at a new Hammer production. Hammer Films enjoyed a modicum of success in the1950s and 1960s, particularly in the horror genre, building a reputation for movies done on a shoestring budget, but always with an eye on quality. Hammer’s success was short-lived, however, as the company became increasingly cash strapped, productions became more threadbare, and the movies stopped coming by the mid-1970s. But the final nail had not been driven into Hammer’s coffin. After a decades-long absence, the Hammer name re-emerged in the 2000s, with new productions, starting with an English language remake of the Swedish film Let the Right One In (Let Me In) and The Resident, featuring Hammer stalwart Christopher Lee, and writer/director Antti Jokinen. Dr. Juliet Devereau (Hillary Swank), recently separated from her husband, is on the market for a new place to live, but finding an affordable (well, for an MD at least) apartment in New York City is a Herculean task. After some trial and error, she locates what appears to be the ideal apartment, with an expansive view of the Brooklyn Bridge and a rental price that won’t break the bank. To sweeten the deal, her landlord is a single handsome guy who might just be a good candidate for boyfriend material while she’s on the rebound from her cheating husband. As any savvy consumer will tell you, however, if it looks too good to be true, it probably is. Strange things are afoot in her new apartment home, as she begins to suspect that her privacy is being invaded, and the landlord’s friendly overtures become a little too close for comfort. Jeffrey Dean Morgan is very good as Juliet’s landlord Max, who may not be the nice guy he appears to be. He seems amiable at first, but as Juliet gradually discovers, there’s more about him, lurking beneath the surface. The good vibes begin to wear off as he loses patience with her ambivalence about entering a new relationship. The cracks in his perfect façade begin to form when she pulls away, and he starts taking things in uncomfortable directions, spying on her and making unexpected visits. Morgan takes us along for a disturbing ride as his character’s sanity erodes. Christopher Lee does a lot with very little screen time As Max’s enigmatic grandfather August. Juliet is unsure how to interpret the elderly man, peering at her down the hall (his gift basket takes on ominous tones). From the audience’s perspective, we’re similarly perplexed about where he stands. But as we soon discover, neither August nor his grandson are what they may seem to be. August harbors a dark family secret, which manifests itself in Max. Aside from being a major selling point, Lee’s brief appearance is an essential bridge to the Hammer films of the past, serving as the film company’s spiritual ambassador of sorts. Even if he didn’t have a single line (and his lines are relatively scarce), Lee carries enough gravitas to make his character work. The Resident falls into the same trap as many modern thrillers, counting on the main character doing stupid things to move the plot along. After a string of mornings in which she oversleeps, she has her blood analyzed, and learns there’s a cocktail of sedatives circulating in her bloodstream. Why she would return home after learning this disturbing information is anyone’s guess. Also, the film misses the opportunity to draw a parallel between her husband Jack’s obsessive behavior and Max’s growing paranoia. Despite Jack’s admission that he’s been stalking her, along with his constant phone calls, she decides to give him a second chance (Perhaps she concludes he’s slightly less creepy than her weird landlord?). Juliet installs a high-tech security system in her apartment, and then proceeds to ignore video records of the intrusions. When it finally dawns on her what’s occurring, nothing is ever reported (why she didn’t just dial 911 immediately is beyond me). Of course, the breach in security is another contrivance for the predictable cat and mouse game between Max and Juliet during the film’s climax. As a contemporary thriller, The Resident is competent, if unremarkable. As a Hammer film, that’s another story. It lacks the gothic atmosphere of many of Hammer’s best horror/thriller movies, or maybe it was the paucity of English accents, but it didn’t have that signature Hammer “feel.”. As I watched the movie, it occurred to me the story could have easily been transplanted to a manor in the English countryside – the New York setting doesn’t suit a Hammer production. Faults aside, The Resident proves nothing with Christopher Lee can be a total loss. Lee makes up for the lack of quantity screen time with a quality supporting performance. If only the rest of the film could measure up.